A technician can either use a machine (digital, rotary or coil) or opt for the hand tool or microblade. Julice uses a machine as well as microblades, depending on what effect she is looking to create. She uses a machine exclusively for eyeliners, lips and areola work. If she is doing a powdered brow, she will use a machine, but when doing the hairstrokes/embroidery/3D technique she often uses a microblade. In the picture below, her client lost most of her eyebrows as she aged so Julice simulated hair strokes for her client using a microblade. Powdered brows are best suited for those clients who desire a fuller, denser brow. Clients with oily skin are excellent candidates for powdered brows. The oils from the skin tend to eat away at the pigment faster so having a denser brow allows for the pigment to last longer. 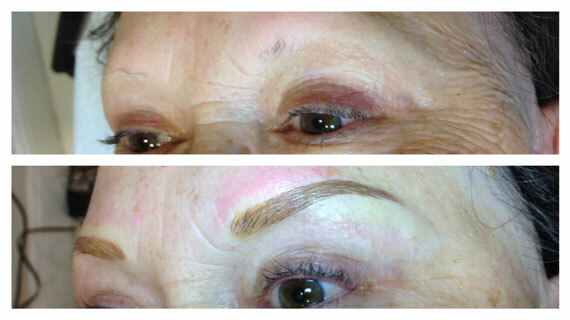 Hairstrokes/embroidery/3D technique is best suited for clients with normal to dry skin and those who prefer soft brows. Both looks are beautiful and natural so Julice will work with you to discover which method works best for your lifestyle as she considers your skin type, age and overall style. This is a healed powdered brow. Notice how it is denser than the hairstroke method, however it is still very natural looking and enhances her eyes. 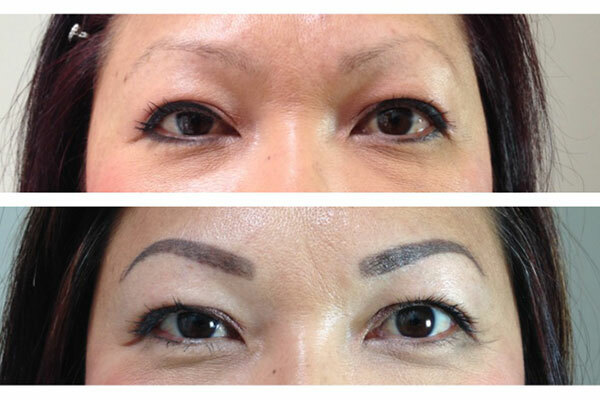 A fuller brow supports her big eyes better and gives her a much more youthful appearance.